The Kansas City Association of Black Journalists Urban Student Journalism Academy will take place June 5 to June 16. This year it is being moved to the Urban League of Greater Kansas City, which has a smart classroom that will accommodate the two-week class. The applications have gone out to journalism instructors throughout the Kansas City area to seek students who plan to go to college to enter the journalism profession. A maximum of 12 students and a minimum of six are needed for the class of 2017. The application is below. The deadline is Saturday, April 29. There will be no extensions. At the April monthly meeting, KCABJ Secretary Anita Parran said she will start sending the minutes to Treasurer Bette Tate-Beaver ahead of the monthly gathering so that members can have access to them via email. KCABJ President Lewis Diuguid told members in attendance that he has started to reach out to potential KCABJ members and past members to get them to join the organization. Email that went out in April will be followed up with phone calls to get people back in the fold. With cutbacks on news media hiring of journalists of color, KCABJ is needed now more than ever. Anita suggested possibly changing the meeting date to make it possible for more people to attend. Bette said she would poll the membership to determine what date works best for most people. Financial and Organizational Stability. No more of that deficit spending. NABJ Jobs involving more hires and promotions in the news industry for journalists of color. Advocacy Activities to speak out more for the needs of journalists of color and for coverage of issues relevant to the black community in the U.S. and internationally. Special Projects, involving convention site selection. NABJ at its April board meeting named 10 cities for NABJ to explore as future convention sites. They are Atlanta, Chicago, Charlotte, Dallas, Las Vegas, New Orleans, New York, Orlando, Philadelphia and Washington, D.C.
Each is a city where NABJ has had a successful convention in the past. KCABJ was founded in 1981, and this year it celebrates its 36th anniversary as an organization of professional black journalists. This is the 33th KCABJ Urban Student Journalism Academy. Many graduates of the program are established in the field or are pursuing careers in journalism. For more information about the academy or the Kansas City Association of Black Journalists call KCABJ Vice President/Print Glenn E. Rice, a reporter with The Kansas City Star at 816-234-4341 or KCABJ President Lewis W. Diuguid at 816-730-9194. The Urban League of Greater Kansas City has been part of the national network of Urban Leagues since 1919. Its mission is to enable African-Americans and other disadvantaged persons to secure economic self-reliance, parity, power and civil rights. The Urban League’s programs provide assistance to area residents to help them gain employment and build sustainable careers. The Kansas City Association of Black Journalists is committed to working with high school and college students to prepare them for careers in print and broadcast journalism or other communications fields. This year’s academy continues that tradition. The 2017 KCABJ Urban Journalism Academy is free to students. It is a commuter program and is conveniently located on a bus line in the Urban League’s newly remodeled high-tech classroom. There is a mandatory orientation on Saturday, June 3. The location will be announced to those students picked for the program. Each student is responsible for his or her own transportation to and from the KCABJ academy each day. Class begins at 8 a.m. and ends at 3 p.m.
Every student who attends the academy leaves with enhanced reading, writing, analytical, communication and questioning skills. Teachers and parents have said teenagers and young adults have returned from the summer energized and far more interested and able to learn than before. Mail this completed application, your essay and writing sample by April 29, 2017, to KCABJ, P.O. Box 32744, Kansas City, Mo. 64111. 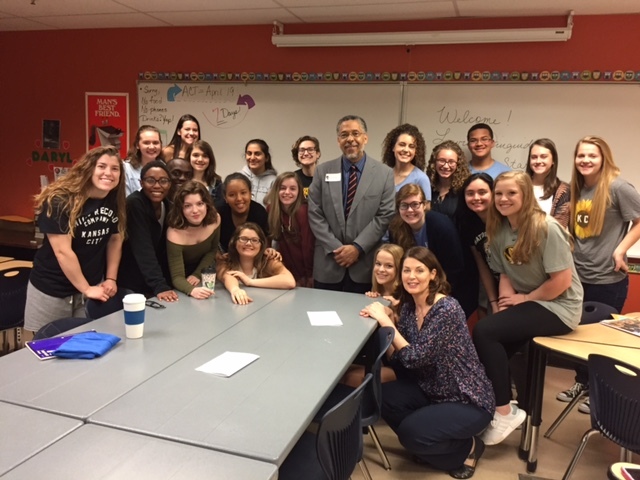 Kansas City Association of Black Journalist President Lewis W. Diuguid spoke on Wednesday, April 12 with Lori Oyler’s journalism class at Liberty High School in Liberty, Mo. Bette Tate-Beaver, KCABJ treasurer, also spoke with the class about careers in journalism. KCABJ this summer is offering its Urban Student Journalism Academy to high school and college students seeking a career in broadcast, newspaper, magazine or new media journalism. Kansas City Association of Black Journalists President Lewis W. Diuguid and KCABJ Treasurer Bette Tate-Beaver (center) on Monday, April 10 spent close to two hours talking with journalists from five countries about the challenges that journalists of color face in the United States. The visiting journalists were Klementina Cenkollari, a political reporter/anchorwoman with ORA News in Albania; Ali Abdulhusain Jawad Khalil Radhi, senior presenter, Ministry of Information in Bahrain; Suhaila MD Zaini, coordinating producer, News Magazine: Business & Tech, Radio Television Malaysia; Luis Pablo Beauregard Alday, reporter, El Pais in Mexico; and Piotr Kusmierzak with Polsat News in Poland. Global Ties KC coordinated the visit at its Union Station office. 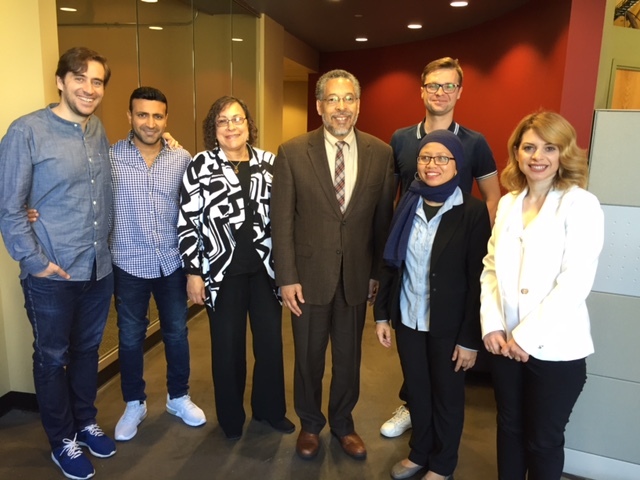 The group, which also visited The Call of Kansas City, was invited to the United States under the auspices of the U.S. Department of State’s International Visitors Leadership Program. The group reached out to KCABJ because of information Global Ties KC picked up from KCABJ’s website, kcabj.org. — Tour area media companies.